With immediate effect the club have a new venue. The new venue is the Belle Vue Social Club on Colne Bank Avenue (postcode is CO1 1UU). We will still be meeting on Wednesdays at the normal time. A number of players appear on the list (or have non-F grades) for the first time (or reappear after dropping off the list) - Dom Lee (going in with the 3rd highest rapidplay grade in the club following an unbeaten 2nd place in the Tony Locke Rapidplay and a number of wins in the NECL rapidplay league), Michael Catabay, Felix Schnell, Brian Remmer and Craig Bradshaw. There were significant increases for Asci Catabay (+23), Mae Catabay (+22), John Duff-Cole (+15) and Pete Smith (+11). A few players have increased their grades with Ian Gooding (+5) having the most significant increase. Zoe Johnson and Mae Catabay appear on the list for the first time; Jan Cesenek, Craig Bradshaw, Asci Catabay also get provisional F grades and appear on the list for the first time. Emil Tihov gets his highest ever grade, his first grade as a Colchester player; slight increases for Svein Kjenner, Mark Johnson and John Duff-Cole also see them reach their highest ever standard play grade. Colchester B finished mid-table in NECL Division 1 with four wins, one draw and four defeats in the league. Their best results were a 2.5-1.5 win against Chelmsford A, a 4-0 win against Billericay A and a 3.5-0.5 win against Chelmsford B. The B team had a few problems getting players in some of the matches early in the season resulting in a few defaults on board 4. Colchester A finished in 3rd place (out of 11) in NECL Division 1 with six wins, two draws and two defeats in the league. Their best result was probably a 3.5-0.5 win against Brentwood A. The A team reached the quarter-finals of the knockout where, fielding no nominated A team players, they narrowly lost to eventual winners Chelmsford A. It was very close at the top of the table, with Writtle, Chelmsford A and Colchester A all getting 25 board points. Chelmsford and Writtle had an extra match point, with Writtle A winning the title on board count. A single extra half point could have resulted in Colchester winning the title. Colchester C finished in 5th place (out of 6) in NECL Division 2 with three wins, one draw and six defeats in the league. Their best results were probably a 2-2 draw against league winners Clacton A and a 3.5-0.5 win against Baddow B. The latter result took place on the same evening as a B team match making it an even more impressive result as they were not able to use the highest-graded player eligible for the C team (as they were playing for the B team). 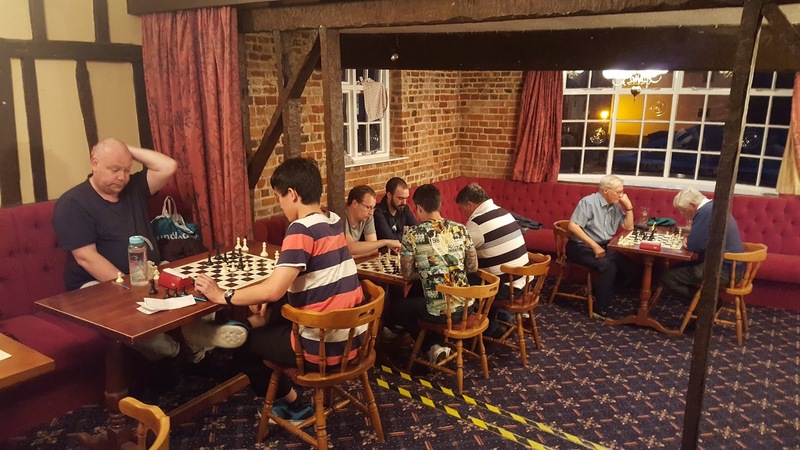 The club's internal rapidplay championship (Tony Locke Rapidplay) was held on Wednesday 30th May. The competition was won by Nathan Barnes (with a score of 4.5/5, matching his score from the previous year). Dom Lee, with an unbeaten 4/5 was second. Matt, Felix and Pete tied for third with 3/5. Ten players took part. In round 1 Matt and Felix were the first to finish. Nathan got a slight edge in a queen-less middlegame against Brian's Grob, it took a while to get there but once the position opened up his more active rooks finished the game quite quickly. Craig sprung the upset of the round - he won a couple of pawns against Mark and that was enough to convert a potentially tricky queen and pawn endgame. The last game to finish was between Dom and John which reached a knight and four pawns each endgame. The position looked drawn but Dom was down to his last few seconds and looked like losing on time. However, an illegal move from John meant Dom gained two minutes and a draw was agreed. Round 2's main talking point was Pete beating the much higher-graded Felix. There were also wins for Nathan, Phil, Matt and Dom. 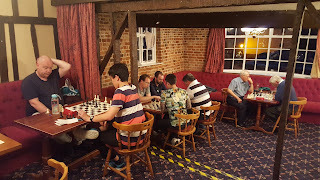 The first two rounds had all been based on seeding with the top 5 seeded players (Matt, Nathan, Felix, Dom and Mark) playing against players from the other half but only two players - Matt and Nathan - had won both their games. This meant that round 3 would see the top two seeds play each other. A blunder in the early middle game saw Nathan lose a piece for no compensation; however, active play in a QRB5P v QR5P endgame along with an awkwardly-placed White king saw Nathan get a couple of pawns and then the bishop. Pete laid a successful opening trap against Craig; Felix recovered from his round 2 loss by beating John; Mark against Brian saw a rematch of the club championship quarter-final with the same result; Phil and Dom's game went to the wire with Dom having a very strong attack but only six seconds on the clock to Phil's 20 seconds, Phil tried to find a defence and lost on time. Round 4 saw the two unbeaten players drawn against each other. A long game went to a fairly even knight and pawn endgame. Nathan had two minutes on the clock to Dom's one but offered a draw to preserve his tournament lead rather than risk going wrong. Matt resigned after blundering a piece against Felix; Pete beat Phil to win his third game in a row and bring himself into contention for first place; a hard-fought game resulted in a draw for Mark and John; Brian beat Craig meaning that everyone had at least a point. Going into the final round, Nathan was in the lead with 3.5/4; Dom, Felix and Pete were half a point back. Mark and Matt's game resulted in a queen and pawn endgame where Matt always had an advantage, these endings can be tricky to win as both sides have to be wary of the other's queen. This was Mark's second queen and pawn endgame of the evening but Matt's extra pawn proved sufficient. 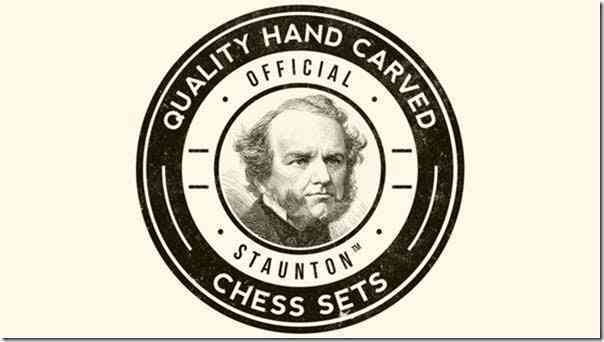 Brian beat Phil when he managed to bring his rook down to the 7th rank after a fairly even struggle. John versus Craig saw John pick up his first win, to go with his two earlier draws. Dom and Pete went into an even endgame where Dom had a rook and five pawns against Pete's bishop, knight and four pawns. A risky knight incursion resulted in Dom being able to trap the knight and force an exchange of his rook for Pete's two pieces, the extra pawn was then decisive. Nathan forced a transposition from a Sicilian to a symmetrical English in his game against Felix, and the typical queenside pawn advances resulted in a clear edge. The finish to this game can be seen below.